We’d love your help. Let us know what’s wrong with this preview of Frederick Douglass on Slavery and the Civil War by Frederick Douglass. A former slave, self-taught writer, editor, and public servant, Frederick Douglass was also among the foremost leaders of the abolitionist movement. Recognized as one of the first great African-American speakers in the United States, Douglass was an advisor to President Lincoln during the Civil War and fought for the adoption of constitutional amendments that guaranteed vo A former slave, self-taught writer, editor, and public servant, Frederick Douglass was also among the foremost leaders of the abolitionist movement. Recognized as one of the first great African-American speakers in the United States, Douglass was an advisor to President Lincoln during the Civil War and fought for the adoption of constitutional amendments that guaranteed voting rights and other civil liberties for blacks. 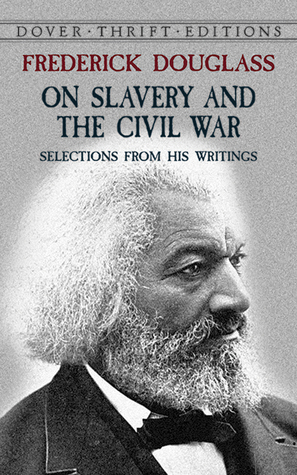 This book includes representative selections from the speeches and writings of this great statesman, with topics focusing on the slave trade, the Civil War, suffrage for African-Americans, reconstruction in the South, and other vital issues. A powerful voice for human rights throughout much of the 19th century, Douglass remains highly respected today for his fight against racial injustice. To ask other readers questions about Frederick Douglass on Slavery and the Civil War, please sign up. The man possessed a great talent in the use of words. His speech on reform, see below, resonates today. Let me give you a word of the philosophy of reforms. The whole history of the progress of human liberty shows that all concessions, yet made to her august claims, have been born of earnest struggle. The conflict has been exciting, agitating, all-absorbing, and for the time being putting all other tumults to silence. It must do this or it does not The man possessed a great talent in the use of words. His speech on reform, see below, resonates today. Let me give you a word of the philosophy of reforms. The whole history of the progress of human liberty shows that all concessions, yet made to her august claims, have been born of earnest struggle. The conflict has been exciting, agitating, all-absorbing, and for the time being putting all other tumults to silence. It must do this or it does nothing. If there is no struggle, there is no progress. Those who profess to favor freedom, and yet depreciate agitation, are men who want crops without plowing up the ground. They want rain without thunder and lightning. They want the ocean without the awful roar of its many waters. This struggle may be a moral one; or it may be a physical one; or it may be both moral and physical; but it must be a struggle. Power concedes nothing without a demand. It never did, and it never will. Find out just what people will submit to, and you have found out the exact amount of injustice and wrong which will be imposed upon them; and these will continue till they are resisted with either words or blows, or with both. The limits of tyrants are prescribed by the endurance of those whom they oppress. In the light of these ideas, Negroes will be hunted at the North, and held and flogged at the South, so long as they submit to those devilish outrages, and make no resistance, either moral or physical. Men may not get all they pay for in this world; but they must certainly pay for all they get. If we ever get free from all the oppressions and wrongs heaped upon us, we must pay for their removal. We must do this by labor, by suffering, by sacrifice, and, if needs be, by our lives, and the lives of others. From being born a slave and escaping to freedom and having to hide for years, but yet be one of President Lincoln's closes friends, he talks very well, very intelligent, for teaching himself to read and write. He did say some good things in there, but if you like history and Fredrick Douglas, then yeah you would enjoy this book, other then that no. Though the introduction served as a nice refresher, the selections serve as teasers and fail to convey the true context of Douglass' speeches and correspondence. Frederick Douglass (née Frederick Augustus Washington Bailey) was born a slave in the state of Maryland in 1818. After his escape from slavery, Douglass became a renowned abolitionist, editor and feminist. Having escaped from slavery at age 20, he took the name Frederick Douglass for himself and became an advocate of abolition. Douglass traveled widely, and often perilously, to lecture against sla Frederick Douglass (née Frederick Augustus Washington Bailey) was born a slave in the state of Maryland in 1818. After his escape from slavery, Douglass became a renowned abolitionist, editor and feminist. Having escaped from slavery at age 20, he took the name Frederick Douglass for himself and became an advocate of abolition. Douglass traveled widely, and often perilously, to lecture against slavery. His first of three autobiographies, The Narrative of the Life of Frederick Douglass: An American Slave, was published in 1845. In 1847 he moved to Rochester, New York, and started working with fellow abolitionist Martin R. Delany to publish a weekly anti-slavery newspaper, North Star. Douglass was the only man to speak in favor of Elizabeth Cady Stanton's controversial plank of woman suffrage at the first women's rights convention in Seneca Falls, New York, in 1848. As a signer of the Declaration of Sentiments, Douglass also promoted woman suffrage in his North Star. Douglass and Stanton remained lifelong friends. In 1870 Douglass launched The New National Era out of Washington, D.C. He was nominated for vice-president by the Equal Rights Party to run with Victoria Woodhull as presidential candidate in 1872. He became U.S. marshal of the District of Columbia in 1877, and was later appointed minister resident and consul-general to Haiti. His District of Columbia home is a national historic site. D. 1895.